Though she’s dating a vampire and a werewolf, Anita is keeping them at arm’s length. Which isn’t easy considering that Jean-Claude is the master vampire of St. Louis and Richard Zeeman is the sexiest junior high school teacher she’s ever seen. Just to complicate Anita’s already messy life, someone has put a price on her head. Love cannot save her this time, so she turns to Edward, hit man extraordinaire for help. But finding the person behind it won’t be easy, because she’s made a lot of enemies—human and otherwise. Anita Blake is a vampire hunter. But when someone else sets his sights on her prey, she must save them both from the inferno.From the Paperback edition. Laurell Kaye Hamilton was born Laurell Kaye Klein in Heber Springs, Arkansas but grew up in Sims, Indiana with her grandmother Laura Gentry. Her education includes degrees in English and biology from Marion College (now called Indiana Wesleyan University). She is an American fantasy and romance writer that is best known as the author of two series of stories. 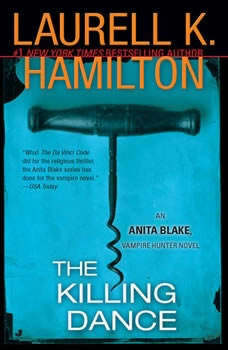 Her New York Times-bestselling Anita Blake: Vampire Hunter series centers on Anita Blake, a professional zombie raiser, vampire executioner and supernatural consultant for the police, which includes novels, short story collections, and comic books. Six million copies of Anita Blake novels are in print. Her Merry Gentry series centers on Meredith Gentry, Princess of the Unseelie court of Faerie, a private detective facing repeated assassination attempts. Hamilton is involved with a number of animal charities, particularly supporting dog rescue efforts and wolf preservation. She currently lives in St. Louis County, Missouri, with her daughter Trinity, and husband Jonathon Green whom she married in 2001. Anita doesn�t just date any two guys she dates two leaders of their supernatural communities. One rules with an iron fist, the other through peace and love. It�s a nice contradiction. As always, her life goes from one shoot-out to another. What is her bullet budget like? The dependable Edward is a great character that I hope we get more of. The Anita Series are quick, fast-paced reads. I always enjoy them.